More On Shiki-Tei, The PS3 Gardening "Game"
Sony Computer Entertainment Japan has released new media and details on Shiki-Tei, the recently announced PlayStation 3 gardening game coming to consoles via the PlayStation Network. If you aren't up to speed on the SCEJ developed gardening sim, it appears to be Viva Pinata for adults, a Pikmin for the city folk who fantasize about a horticultural utopia devoid of cutesy characters. Yes, chipmunks are cute, but they're not googly-eyed cute. 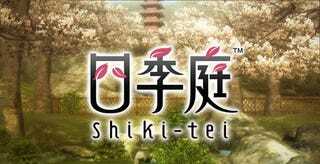 Shiki-Tei will be available to Japanese gamers later this month when it goes on sale for 1500 yen on the PlayStation Store. The gardening game features both Japanese and Western style gardens, photo sharing, over 150 plants, two dozens animals, and a chance for salarymen and their wives to flex their green thumbs virtually. It may look like an odd addition to the relatively scant PSN line-up, but perhaps Sony is hoping for a slice of the casual set with this off-beat (and quite pretty) title.